“Almost Orwellian” — that’s the description a federal judge gave earlier this week to the massive spying by the National Security Agency (NSA) on virtually all 380 million cellphones in the United States. The British government had used general warrants — which are not based on individualized probable cause and do not name the place to be searched or the person or thing to be seized — to authorize British soldiers to search the colonists wherever they pleased for whatever they wished to seize. The reason for the Fourth Amendment requirement of individualized probable cause and specificity in the warrant is to prevent the very type of general warrant that the NSA has claimed is lawful. The reason for preventing general warrants is that they have become an instrument of tyranny. It is against this well-known historical context that Leon engaged in his analysis of the feds who spy on us. This is truly the first jurisdictionally based judicial ruling on the cellphone aspect of the domestic spying that former NSA contractor Edward Snowden revealed last spring. Though the NSA and the Obama and Bush administrations have claimed that judges of the Foreign Intelligence Surveillance Court (FISC) not only found the NSA cellphone spying to be constitutional, but also authorized it, those judges were performing a statutory clerical function, not a constitutional jurisdictionally based judicial function. The Constitution requires a case or controversy — basically lawyers arguing against each other on behalf of clients whose interests are adverse — in order to invoke the jurisdiction of federal courts. The FISC judges, who sit and sign in secret, do not do so under the Constitution, because they have no case or controversy before them. They have only the NSA before them. 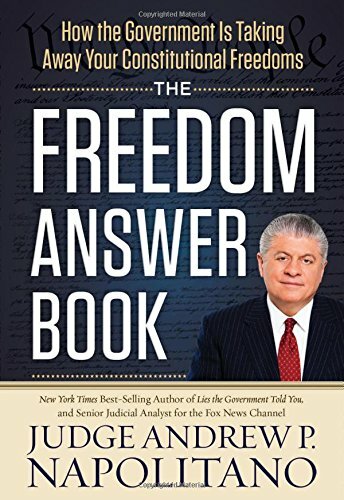 Leon was the first federal judge to rule on the constitutionality of NSA The Freedom Answer Boo... Andrew P. Napolitano Best Price: $1.11 Buy New $2.99 (as of 06:30 EDT - Details) spying under the Constitution — in the context of a litigant challenging the government and the government defending itself. And he found that spying to be in violation of the Constitution. In his ruling, he dispatched with clarity the government’s argument that two Supreme Court cases from the late 1970s and early 1980s, in which the court permitted evidence obtained from telephone billing data without a search warrant to be introduced in criminal cases, support the constitutionality of the NSA’s phone metadata collection. That was before the era of cellphones, and that was before the Supreme Court ruled that a search warrant is required to hunt electronically for marijuana plants in a home and to install and follow a GPS in a car. By ruling that two now-outdated Supreme Court cases are no longer controlling, he almost guaranteed that the high court will take this case. The NSA was emasculated before Leon. Gone were the lies of Director of National Intelligence James Clapper, who stated under oath that the government does not spy on Americans. Gone was the bravado of NSA boss Gen. Keith Alexander, who claimed initially under oath that his spies stopped 52 terrorist plots and then mysteriously corrected himself and said they really stopped just three, but declined to identify the three. Gone was the if-we-don’t-do-this-we-all-will-die argument. Gone was the if-you-have-nothing-to-hide-you-have-nothing-to-fear nonsense that congressional NSA apologists have advanced. In place of the political claptrap is the court’s finding that not only is the NSA spying unconstitutional, but it doesn’t work. After hearing the NSA state its case, Leon wrote, “I have serious doubts about the efficacy of the metadata collection program as a means of conducting time-sensitive investigations in cases involving imminent threats of terrorism.” And he added an admonition that it doesn’t help the NSA’s case to be less than candid with the judge. Even though Madison would be aghast, surely the Obama administration will appeal this, and just as surely, appellate judges or Supreme Court justices will have the final say. But for now, we have the great satisfaction of knowing that an independent judiciary has saved our liberties from the tyranny of the majority. And this is a cause for great joy. Also a cause for great joy is the rebirth of Christ in our hearts as we celebrate Christmas. As we do so, may you embrace and enjoy the freedom to seek the Truth. And may you find the Truth, which is Him.